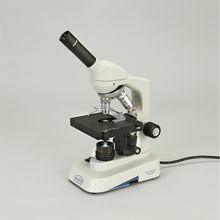 Wolfe® LED Educational Microscopes is rated 4.0 out of 5 by 1. Grades 7–12. If you&apos;re looking for an educational microscope that&apos;s well designed, versatile, and durable, Carolina offers you an exceptional value with your choice of one of our quality Wolfe® LED Educational Microscopes. Cool, variable-intensity LED illumination eliminates heat buildup that can affect live microorganisms. Grades 7–12. If you&apos;re looking for an educational microscope that&apos;s well designed, versatile, and durable, Carolina offers you an exceptional value with your choice of one of our quality Wolfe® LED Educational Microscopes. Cool, variable-intensity LED illumination eliminates heat buildup that can affect live microorganisms. Separate coarse and fine adjustments give faster, more accurate focusing at high magnifications. Built-in mechanical stage on some models makes it easy to scan the entire specimen without using fingers to move the slide. Exceptional performance—These high school microscopes have LED illumination with rheostat control that radiates little or no heat compared with lower-priced models with tungsten illumination—a very important benefit when you&apos;re working with live microorganisms. LED illumination is also whiter and promotes far longer bulb life. The focus mechanism has separate coarse and fine adjustments, incorporating travel stops and a slip clutch to protect slide, objectives, and focus mechanism. Flexible options—Choose between models with "one-touch" stage clips for ease of use and advanced models with a built-in mechanical stage for smoother slide positioning. We also offer a dual viewing model (item #590962), which is an excellent choice for adding a second user or an accessory such as a digital camera. Exceptional value—Get the features you need, including an inclined head, in-base LED illuminator, and iris diaphragm, at affordable prices. Quality DIN** optics include a widefield 10x pointer eyepiece and 40x and 100x objectives that retract to prevent possible slide damage. Locked-on eyepiece and stage clips protect against loss and tampering. Five different configurations are available, and each comes with dust cover, foam case, and Wolfe® lifetime limited warranty (excluding bulb, cord, and fuse). Size, 14" H x 5" W x 6-1/2" D; wt, about 7 lb. Rated 4 out of 5 by MrsK from great for elementary and middle school Great tool for younger students. Not enough detail for High School or AP.